Dual camera setup to remain exclusive to the iPhone Plus until 2018? KGI Securities analyst Ming-Chi Kuo, possibly the best Apple analyst in the industry, is already making predictions about the 2017 Apple iPhone models. In a note sent to clients, Kuo says that the dual camera setup found on the Apple iPhone 7 Plus will remain exclusive to the 5.5-inch phablet with next year's models. The analyst says that Apple doesn't want to make it available on the lower priced 4.7-inch phone yet, because of its cost ($30 to $40 extra per phone) and because it is way too soon to see if it is a feature that the 'mass market' will employ. 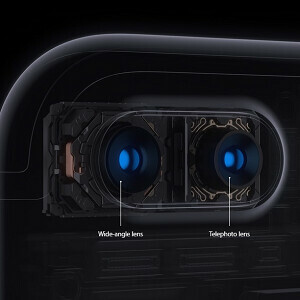 Kuo says that changes in the dual camera next year will most likely include the use of OIS in the telephoto lens. This year, the stabilization feature is limited to the wide angle lens. Because next year will be the tenth anniversary of the iPhone, Apple will be making many changes to the phone on what normally would be an "S year" for the device. Changes could include the use of an edge-to-edge screen with the home button embedded under the glass. The phone could feature an OLED display and curve around the side of the handset. There already has been talk of an iris scanner, and we wouldn't be surprised to see the 5.5-inch model sport the Smart Connector as seen on iPhone Pro leaks all throughout the summer. I hate Apple for this.. I like small factor devices, but I want that camera so much. It's not about the price at all - just want the small phone - SE sized with that camera!!! SE size iphone with dual camera, OLED and edge to edge diaplay, jet black color. Oh god ! Apple please think about it. They won't, because it completely eliminates the up-sell. The plus model costs pretty much the same as the regular model to make and generates more profit. Sadly, if they made the iPhone 1 mm thicker, they can easily fit everything in. Clearly the competition can put just as much or more tech into their phones so it isn't a design limitation. I know apple will never design such an SE. That is alright for me. But i hope they continue this SE product line just like other two iphones. Many people say that SE was launched to make up for some of the loss , after 6s sell was less than expectation. I fear that if other two models start breaking records again, they might discontinue SE. I ordered a 256GB iPhone 7 Plus but I'm still using my SE as my daily driver. So I pray that they put more effort into the SE replacement. It's been delightful using a small and fast phone on the go. SE is dead. Small screen size market is too little now. The small screen size market is not dead. The main problem is that SE is sold at exorbitant price in developing countries , where people cannot afford multiple products. So majority of them stick to phablet size smartphone. There SE is being sold at the cost of iphone 7 in USA. Many people would still like to own a 4 inch powerhouse like SE at reasonable price. IF the amount of SE iPhones sold Is considered "dead" than nearly ALL android devices sold are "dead"!!! Devices like SE and 5C have sold dramatically more than almost any android device at that time. Considering the size of the camera setup and possibly the sensor it would be quite a feat if Apple can fit all that in the iPhone SE. I don't find the 2x zoom to be all that useful but the depth of field on the other hand sounds interesting but again not extremely necessary and I could make do with the smaller iPhone 7. I know right? Hooly crap, never been so surprised for a Apple camera in a long a** time. DXOmark new champ? Won't happen since both camera work independently of each other. You can use one or the other and that means one would have to beat the current king in the GS7/HTC10/Sony. The telephoto lens can't do it, its not meant for detail and is supplementary. The primary camera is similar to last time. The new primary aperture is 1.8 while the old one was 2.2. This is a big difference in terms of lowlight quality pictures. Do you get tired of note 7 jokes. it got old really fast when iPhone 6 got bending issues. It's got old with note 7 explosions. People are getting hurt. I had some fun with it in he beginning, but now that houses and cars are burning down - fun is over. Very true, turn them in, I did. Picking up a 7 Plus Friday, and Note down the road. I hope you never loose your house to an unexpected electrical fire. Along with photos of your kids, you sentimental stuff, your personal belongings, and have to start you life all over again. It's not just "feelings" - it's your entire life history goes up in smoke (not to mention potential death of you or loved one). It is simply NOT FUNNY. Meanwhile Unordinary is still LOL'ing by the old joke like it's less than a day old. Since most highend phones have OIS, how is it this phone dowsnt on both cameras? I mean how hard can it be to add such? Excuse to get people to buy the next model? They both have OIS, how did you get the idea that they didn't? Seriously, reply to me. I want to know. Read the article! Only the wide angle lens in the iP7+ has O.I.S. No.......both the smaller model and the Plus model have component based OIS. What the article refers to is the OIS in the dual camera, in which one lenses has component based OIS and the other has digital software based OIS.